Are you tired of carrying your laptop power adapter with you between home and work? Have you forgotten or lost your adapter or has it just stopped working? You are not alone. Take comfort in knowing that Aluratekâ€™s universal laptop adapter is fully certified and energy star rated for efficiency supporting just about every laptop or netbook on the market. Another quality product brought to you by Aluratek. The Aluratek Laptop/Netbook Power Adapter is truly versatile. 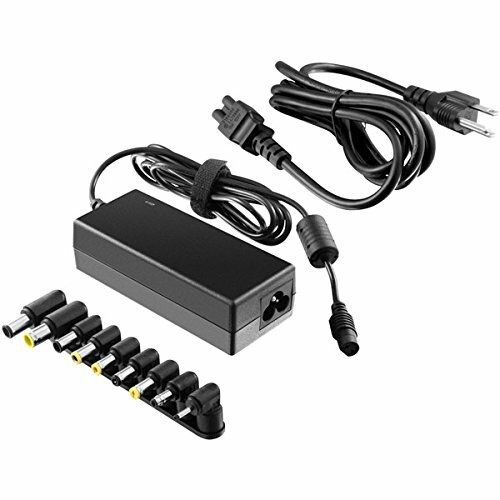 Its 9 interchangeable DC charging tips are compatible with virtually all major laptop makes and models including Dell, HP, Acer, Lenovo, IBM, Sony, Asus, Toshiba, Fujitsu, NEC, LG, Panasonic, Gateway, Hitatchi, Sharp, Samsung, and Compaq. It's a must-have for any mobile professional. The Aluratek adapter plugs into any AC power outlet anywhere around the world, and provides a reliable power source to run your laptop or netbook computer and charge its internal battery. Take comfort in knowing that Aluratek's Universal Laptop/Netbook Power Adapter is fully certified and ENERGY STAR rated and provides complete circuit and input fuse protection for the full range of 100-240V AC input. To ensure that the proper voltage is delivered to your laptop or netbook, you must use the correct tip for your exact laptop. Please refer to the Tip Guide on the back of the box for reference. Dimensions: 11.1" x 6.3" x 2.1"